In May of 2017 we congratulated Chattanooga’s EPB Fiber for exceeding 90,000 subscribers and contributing to lower power rates for all (Electric Power Board) EPB customers. Now less than a year later, there is more to celebrate as EPB expects to reach 100,000 subscribers by Fall 2018 and is still lowering electricity costs for all customers. The city-owned electric utility launched its citywide fiber optic network in 2009 and never looked back. The original plan issued nearly a quarter of a billion dollars in debt for the utility and had an estimated forecast for only 35,000 subscribers. The city is now reaping the rewards from its investment; the utility paid off the last of its debt earlier this year, and now projected revenues for the fiscal year 2018-2019 from the telecom division sit at $169.1 million. For a detailed, interesting history on EPB Fiber Optics, take some time to listen to Harold DePriest talk with Christopher in episode 230 of the Community Broadband Bits podcast. Before retiring, Harold was the tip of the spear in bringing the network to Chattanooga. While EPB has long been recognized for its lightning fast Internet speeds and has repeatedly been ranked among the fastest in the U.S. (including this year’s fourth fastest ISP in the United States), the utility’s fiber optic lines also help lower power rates for all customers by eight percent. Whether Chattanoogans subscribe to EPB Fiber for Internet access or not, they still benefit from the infrastructure. On June 18th, PCMag came out with its list of “The Fastest ISPs of 2018.” The analysis looks at ISP performance in several different ways and provides a range of different side-by-side comparisons. The results prove that publicly owned infrastructure has in important role in bringing high-quality Internet access to Americans. Check out a larger map here. 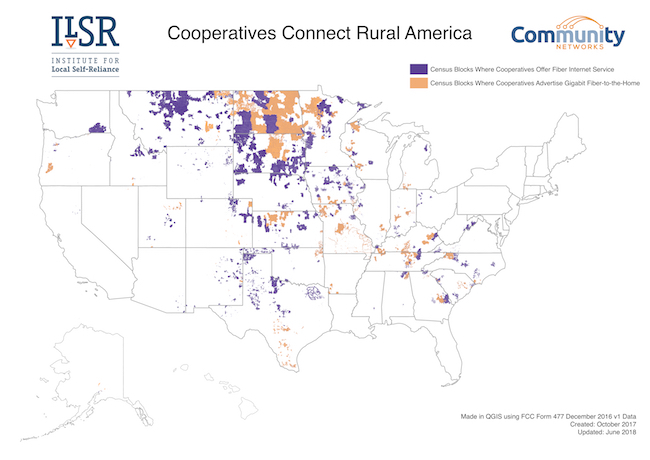 Like rural electrification in the 1930s, cooperatives are taking on the task of bringing high-speed Internet service to members in rural areas. They live and work in the areas they serve. Big ISPs don’t consider sparsely populated areas suitable investment opportunities, so electric and telephone co-ops are repeating the approach of the 1930s, but this time with fiber networks. 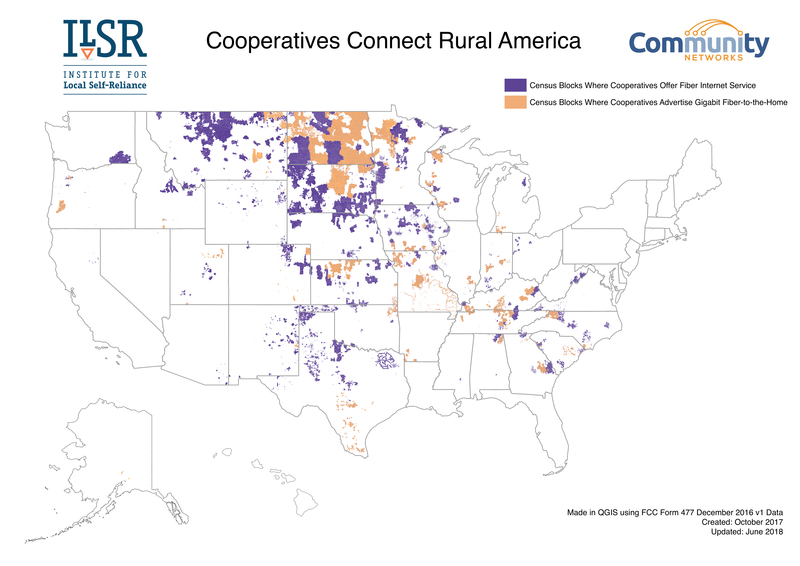 Dickey Rural Telephone Cooperative in North Dakota and Venture Communications Cooperative in South Dakota are only a few that have worked to get their members connected. Hillsboro, Oregon, has studied the possibility of investing in high-quality fiber connectivity for residents and businesses since 2014. After considering the pros and cons, this northwest city of 105,000 has decided to move ahead, with spring 2019 as a target launch date of its own Internet access service. In January, the City Council approved establishing a communications utility, creating a communications fund, and taking the necessary steps to develop a dig once policy in the city’s code. Elected officials had not yet decided if the community would pursue a city-wide network, but wanted to create an environment that would offer future options and encourage private sector partners to invest in Hillsboro. The city already owns fiber optic resources that it uses for municipal facilities, schools, traffic signals, and other purposes. They plan to use that network as a foundation to expand in order to bring better connectivity throughout the community. With a wider network, Hillsboro hopes to adopt public Wi-Fi, better public safety notifications, and applications for smart-meters for utility services as well as real-time parking and traffic updates. Hillsboro plans to offer gigabit connectivity at around $50 per month but hopes to provide the same symmetrical service to lower-income households at a lower rate. In addition to equitable access for all income levels in Hillsboro, the city wants to ensure that students have the ability to compete. “For our students, for our businesses, and for our entire community, we are moving forward now to expand the City’s fiber network to include Internet service,” said Hillsboro Mayor Steve Callaway. “We want to ensure affordable, equitable high-speed access to keep Hillsboro competitive with cities around the world." The city wants to ensure that network neutrality protections remain in effect in the community for individuals and businesses. Encouraging entrepreneurs and making high-quality access with good customer service affordable for all subscribers are more goals they intend to pursue. Reedsburg Rebrands Gigabit Internet Access; Say Hello to "LightSpeed"
One several occasions, local leaders in communities with municipal networks have told us that one of the lessons they’ve learned is that marketing is important. While municipal networks can be considered utilities by community leaders who manage and operate them, they still need to be mindful of business in order to enhance subscriber numbers, compete with other ISPs, and establish a brand. This month, the Reedsburg Utility Commission (RUC) in Wisconsin launched a new brand for its triple-play network. We’ve written about RUC’s network in the past, including their efforts to expand to rural areas and the decision in 2014 to offer gigabit connectivity. We even interviewed RUC General Manager Brett Schuppner in 2015, who shared the history of the network back to 2003, which means it’s one of the oldest Fiber-to-the-Home (FTTH) networks in the U.S.
Now, subscribers can obtain gigabit connectivity for $44.95 per month when they purchase bundled services. In addition to gigabit Internet access, residents can subscribe to a 100 Megabits per second tier. The service is symmetrical, so upload speeds are as fast as download. Symmetrical connections allow subscribers the ability to send large data files as well as receive them, which creates a better environment for entrepreneurs, teleworkers, and students who need robust connections for homework. On April 14th, folks in Alford, Massachusetts, gathered at their fire house to attend a presentation about the bright future of their connectivity. After a long journey to find better connectivity in the small western Massachusetts town, residents and businesses are now subscribing to Fiber-to-the-Premise (FTTP) Internet access from AlfordLink, their own municipal network. With only around 500 residents in Alford, it’s no surprise that big incumbents decided the lack of population density didn’t justify investment in 21st century connectivity. By 2012 and 2013, the community had had enough; they decided to pursue their own solution with a municipal network. Alford voted to form a Municipal Light Plant (MLP), the entity that that manages publicly owned networks in Massachusetts. In addition to the $1.6 million the town decided to borrow to spend on fiber optic infrastructure, the town will also receive around $480,000 in state grant funds. The Massachusetts Broadband Institute (MBI) is handling distribution of funds to Alford and other towns that have decided to use the funding to invest in publicly owned Internet infrastructure. Alford, Blandford, and Shutesbury, are a few of the hilltowns contracting with Westfield Gas+Electric (WG+E) in Westfield. WG+E’s WhipCity Fiber began by serving only Westfield, but now contracts with other small towns to either assist them as they establish their own telecommunications utilities or to provide Internet access and operate a publicly owned network. In very small communities like Alford, they may not feel they have the resources or expertise to manage a gigabit network, but don’t want to relinquish control of their connectivity to an untrustworthy corporate incumbent. When Fort Collins voters chose to amend their charter last year, they were choosing a path to simplify their ability to improve local connectivity. When Comcast tried to derail the measure to protect their monopoly, community members established a vibrant grassroots effort to overcome the influx of cash and disinformation. Now, Fort Collins is moving ahead after establishing that they intend to issue revenue bonds to develop a municipal fiber optic network. After all the spending was totaled last December, Comcast and CenturyLink under the mask of Priorities First Fort Collins, spent $900,999 to try to defeat measure 2B. The proposal passed anyway and allowed the city to amend its charter. That change allows Fort Collins to issue bonds for telecommunications infrastructure and to take other steps necessary to offer Internet service without taking the issue to the voters a separate time. Thanks to the efforts of Colin Garfield and Glen Akins and their citizen-led effort to educate and correct Comcast’s disinformation, voters in Fort Collins passed measure 2B. The city opted out of the state’s restrictive SB 152 back in 2015 and voices in the community have advocated for exploration of a publicly owned option for several years. Seems people and businesses in Fort Collins were not able to get the connectivity they needed and incumbents weren’t interested in providing better services.